Phnom Penh (Khmer: ភ្នំពេញ, IPA: [pʰnum peːɲ]) is the caipital an lairgest ceety o Cambodie. Locatit on the banks o the Mekong River, Phnom Penh haes been the naitional caipital syne the French colonised Cambodie, an haes grown tae become the naition's centre o economic activities. Phnom Penh haes grown tae become the industrial, commercial, cultural, tourist an historical centre o Cambodie. Ance kent as the Pearl o Asie, it wis considered ane o the loveliest o French-built ceeties in Indocheenae in the 1920s. Phnom Penh, alang wi Siem Reap an Sihanoukville, are significant global an domestic tourist destinations for Cambodie. Foondit in 1434, the ceety is notit for its bonnie an historical airchitectur an attractions. There are a number o survivin French colonial biggins, such as the Ryal Palace, Phsar Thmei, an ither French style biggins alang the grand boulevards. Situatit on the banks o the Tonlé Sap, Mekong an Bassac rivers, Phnom Penh is hame tae mair than 2 million o Cambodie's population o ower 14 million. 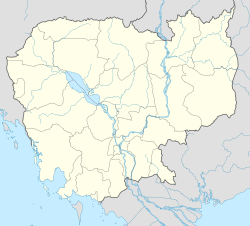 It is the wealthiest an maist populous ceety in Cambodie an is hame tae the kintra's politeecal hub. Cambodia–Vietnam Friendship Monument at Botum Park. ↑ Peace of Angkor Phnom Penh. Retrieved 2007-07-27. Wikimedia Commons haes media relatit tae Phnom Penh. This page wis last eeditit on 5 Januar 2019, at 07:50.